Road closures and detours are a pain! We have routes we take on a regular basis and when that route is closed and a detour suggested it can just add time to our commute and aggravation to our day. I have had to encounter several of these detours as I go about my normal routines recently. I am a “local” so I know the short ways around these closures but so do other locals. People fly on these back roads. People are not only aggravated that they have to take a different route but they are hurrying so that they make up time due to the detour and drivers can get a little dangerous. My life gets that way. I have a plan for my day, for my week, for my life. Things don’t go as planned. I come upon a detour – perhaps one the Lord put there for my safety – and I get aggravated and try to find a short cut and rush through things to hurry up and get to the end. Along the way I may have made a bigger mess out of things or simply not enjoyed the new scenery and experiences God put in my path. No matter what we’re going through, God will use this new direction to teach us something He knows we need to learn in order to draw closer to Him. If we go too fast and mess something up or we fail to enjoy the journey, He will quickly turn our attention to what He wants us to see, learn and enjoy. Don’t get annoyed with the road closures and the detours in our life. God may have changed our path because the road we were traveling had a bridge that was out and we were approaching unknown danger. Just know that no matter the detour, God’s got us covered! Romans 8:28 – And we know that in all things God works for the good of those who love him, who have been called according to his purpose. This entry was posted in devotional, inspirational, motivational, spiritual on July 28, 2017 by Deanna Young. Did She or Didn’t She? That is the Question! A loud scream beckons our call. She is curled up in a ball, cell phone in hand. It’s the news we have been waiting for. Nine years of hard work comes down to one word. The screen is green. She’s crying happy tears. PASSED! 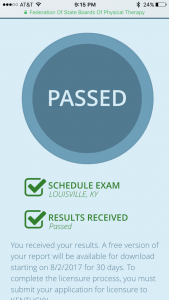 Kiersten is now officially a Physical Therapist! She has studied for months preparing for her board testing. She has worked so hard. Over 200 hours of studying, nine years of schooling, five hours of testing and seven long days of waiting for results. And thankfully it all paid off. But Romans 9:16 says: It does not, therefore, depend on human desire or effort, but on God’s mercy. 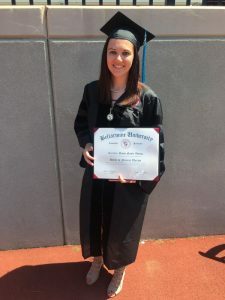 We know that Kiersten put forth every last bit of effort she could studying, learning, practicing and doing everything the experts say to do all the way from taking the practice tests at the exact time of day of the formal test to getting a hotel room and “unplugging” and relaxing the night before the test. She put her heart and soul into studying for this test. Her effort was 100 percent. She (and all of her friends and family) obviously had the desire and Kiersten put forth the maximum effort. But we all knew deep down that it was still dependent upon God’s mercy. 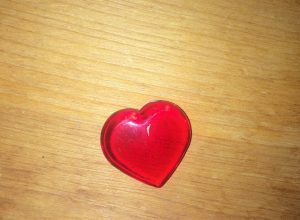 The day before the test, I gave Kiersten a red heart stone that I prayed over for her to keep with her as a reminder that God was watching over her and that we prayed His mercy pour out on all her efforts. We are so thankful that He blessed her hard work and desire. We are so very proud of our daughter, Dr. Kiersten Dawn-Nicole Young, PT, DPT. This entry was posted on July 27, 2017 with tags: Bellarmine University Physical Therapy by Deanna Young. It’s National Hot Fudge Sundae Day! Gooey, rich hot fudge dripping off of a scoop… no wait – TWO SCOOPS of mint chocolate chip ice cream. The fudge just warm enough to melt a little of the ice cream as the mint flavor swirls into the thick richness of the chocolate. HOLY COW……..somebody get me a hot fudge sundae and quick! Can you envision this beautiful masterpiece of delicious delight? There’s no other dessert that I love better than something with hot fudge. Hot fudge is the king! Hot fudge is the ultimate reward. Hot fudge is the “icing” on the cake – or rather the topping on the sundae! How excited I get for hot fudge. So silly isn’t it? But God blesses us every day with His own extra hot fudge. We ask for blessings from Him, for answers to prayers and He just smiles because we have no idea that we are only asking for a little in comparison to the rich, flowing, hot fudge of blessings He has in store for us. His love is the extra hot fudge. It’s more than we can ever imagine. Believe today that God can answer your prayers and bless your life with an overabundance, overflowing richness that can come only from Him. He wants to bless us with extra hot fudge in the ice cream sundae bowl of life! Talk to Him. Ask Him. Believe Him. Love Him. Ephesians 3:20 – Now to him who is able to do immeasurably more than all we ask or imagine, according to his power that is at work within us, to him be glory…forever and ever. Join me today in celebrating answers to prayers, blessings from above… and mint chocolate chip ice cream with extra hot fudge! 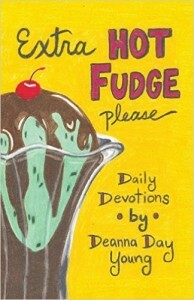 This entry was posted on July 25, 2017 with tags: believe, Extra Hot Fudge Please, inspire, motivate, National Hot Fudge Sundae Day, prayer by Deanna Young. The runners are set on their starting blocks. Hands strategically placed on the asphalt. Finish line only 100 short yards ahead. There is no need to remind them to stay in their own lane. It’s an unwritten rule. No one would think about veering from their own lane into another lane… would they? Of course not! And we shouldn’t either. I just came home from an awesome speaker and writer conference in North Caroline where there were over 800 women soaking in information like sponges. Most were striving to become better speakers or writers; some with pounding hearts and sweaty palms hoping to get a nod from a publisher; others seeking diligently for God’s clear direction. And then the Lord gently nudged me and said STAY IN YOUR OWN LANE. He reminded me that He called me to do what He called me to do. And He called those ladies to do what He called them to do. We can’t scoot over into someone else’s lane or we are disqualified. We can’t run their race. So today, I vow to stay in my own lane. Elbow the devil out of my lane. Stay MY course and not worry about comparing myself to others. 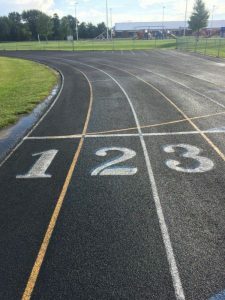 God has called me to do what I do and as I grow in my writing and my speaking, He will clear the path in my own lane and help me run the race I’m called to run. Have you lost sight of your own race? Are you scooting over into someone else’s lane? Refocus. Get set on your own starting blocks. Run your own race. Make a difference in your own lane. Get ready….set…..go. This entry was posted on July 24, 2017 with tags: #make a difference every day, motivate by Deanna Young.